I don’t know what it is I did to deserve this, but lately I just can’t get a good story to write about. People like Melchizedek get to cover really cool interviews with Shigeru Miyamoto, while I get handed stories about Tingle, pieces of chicken shaped like Ocarinas, and now some guy who painted shoes with Zelda designs. However, like any good journalist, I will put on my happy face and bring you the best and most informative piece I can. Surely you folks are aware of Pimp My Ride—a show on MTV featuring rapper Xzibit finding people with horribly-beaten-down cars and giving them a complete upgrade. Basically, this guy is just like that, except 1) he doesn’t show up at your house; 2) he revamps shoes instead of automobiles; and 3) you can actually request his services. 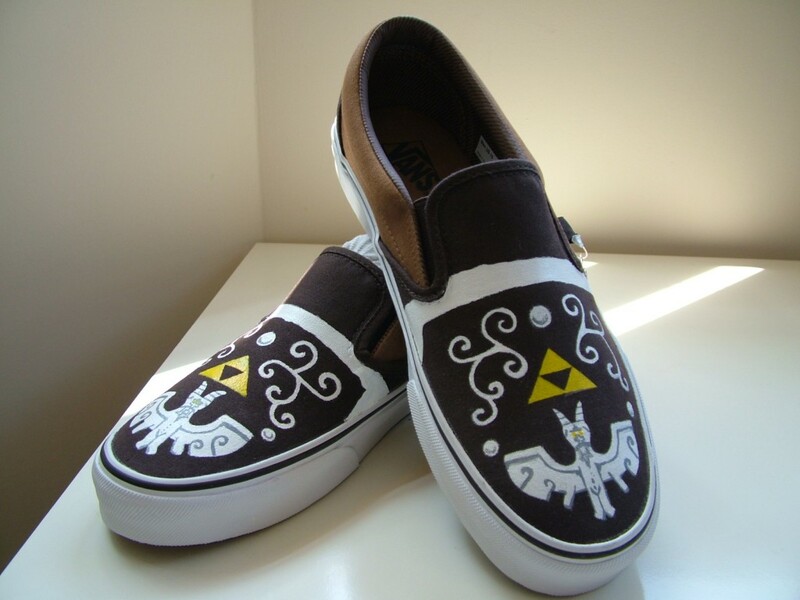 For £125, you can get your very own pair* of uber-geeky Zelda kicks, the first based on Link’s shield design from The Wind Waker, and the second on the one from Twilight Princess (former pictured below). He’s also remixed shoes featuring designs inspired by Phoenix Wright, Noby Noby Boy, and Grim Fandango, which you can view on his Flickr. As of right now, only the Zelda editions are available for purchase. * Side effects may include nausea, vomiting, loss of friends, decreased ability to get phone numbers, and an increased risk of black eyes.